It's Blue Monday at Smiling Sally's. Stop by and see all the other great blues for Monday. At Linderhof, blue is a thread that runs through each and every room. 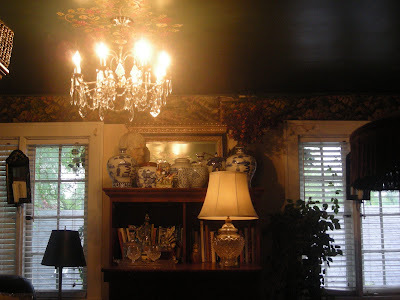 Not in wall paint nor in fabric but rather in the blue and white porcelains and plates that are in each and every room. 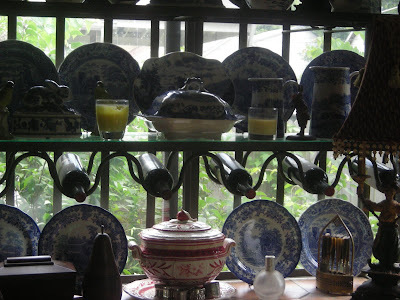 The breakfast room has a baker's rack full of blue and white Spode plates, platters, pitchers and tea pots. 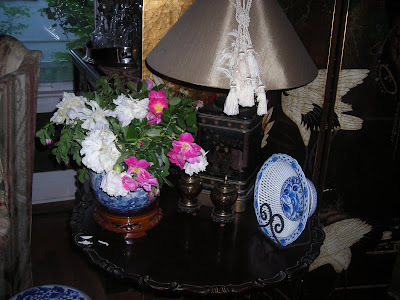 In the living room, two favorite oriental pieces share a tabletop. A lot of our dishes are blue and white and even though the patterns don't match, I think all blue and white go together. The top of this piece is full of blue and white -- because I like it there -- it has more impact as a grouping. But, it also was the only place that I could fit that much blue and white in one place. Isn't is amazing how blue and white dishes go together no matter if they don't match. Blue was my mothers favorite color and almost all of her clothing was some form of blue. Funny, I hardly ever wear blue. Always fresh, and such a nice contrast to serve food on blue and white plates, really enhances each dish. You have a pretty extensice collection, as I got to see first hand. Must make collecting alot of fun! Love your collection, Martha! And yes - I totally agree that they have much more impact when grouped together - however, I wouldn't mind just one piece of your beautiful collection! :) Happy Monday! Everything looks so lovely in the garden!. 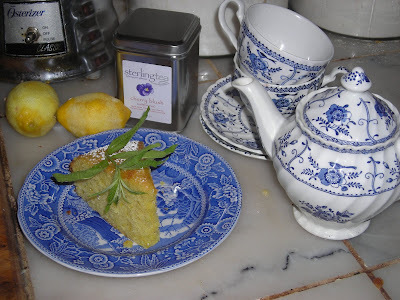 Your lemon cake looks divine and the perfect light desert to serve to company. What a great treat to meet Nancy, I read her blog too and she is just the sweetest gal. Take care and enjoy your day, and get some much needed rest after your busy but fun garden weekend. I love blue & white china. And yes it all goes together. Blue runs through my house also. I have always loved that tranquil color. And you're right, it does always blend together no matter the pattern. I love your blog, by the way! Adding it to my sidebar. Anything that has the words 'Blue and White' in the title is sure to get my attention. I love my blue and white against a yellow background, a white background and even against a red wall. To me it simply says 'home'.